In October, we asked our readers what type of on-the-job training their companies provide employees, and with 23% of the votes, “supervisors/managers train employees” was the most common response. “Access to online training classes and resources” was second with 18%, followed by “self-guided training” with 17%. Does Your Company have a Formal Mentorship Program? In the business world, mentorships can be especially important for training and developing future leaders and inspiring innovative thinkers. 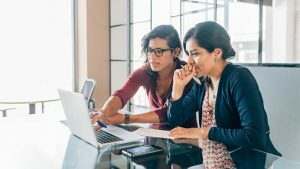 And, implementing a formal mentorship program is a great strategy for building employee retention in a booming economy that is creating a labor shortage across a wide variety of business segments. From young, entry-level employees, all the way up the ladder to the C-suite, mentorships help build expertise and retain knowledge that drives business growth and success. Although creating an effective mentorship program requires a significant amount of planning, from structuring your program to ensuring its success long term, the benefits truly outweigh the effort in the long run. Does your company have a formal mentorship program? How effective is it? How is it structured? Let us know in the comments section below. One Response to The Results Are In: What Type of On-the-Job Training Does Your Company Provide? Wow, this is super interesting to me that only 18% of people surveyed had access to digital training. After having worked at Lessonly (an online training software) for five years, it’s so interesting to me that so many companies are still not using technology that’s so accessible. Even if you use something less effective for training like having a stockpile of Google Docs, it’s at least in a digital format and documented, rather than having to experience all your training in person. Thanks for sharing!